Women, Complementarianism, and the Trinity- How getting subordination wrong has undermined the Trinity | J.W. Wartick -"Always Have a Reason"
The doctrine of the Trinity is a subject of enormous theological debate. One of the major debates of our time is social trinitarianism as opposed to substance views of the Trinity or other classical positions. However, another important area to explore is the nature of Christ’s submission to the Father. Paul writes in 1 Corinthians 15:28 “When he [God the Father] has done this [put all things under Christ’s feet], then the Son himself will be made subject to him who put everything under him, so that God may be all in all.” Some have argued that this means that Jesus Christ is eternally into the future, and even from eternity past, subordinate to God the Father (see Wayne Grudem and Bruce Ware for two examples of scholars who hold to this view–in fairness to John Kleinig, cited above, I do not include him as one of those who assert these positions because his view of the Trinity was not fully developed in the material from him to which I have access). We shall refer to this position as “necessary role subordination,” following McCall and Yandell. The error can be understood by viewing the Trinity within the substance based metaphysics from which the doctrine has been classically analyzed. As William Alston notes in his study of substance metaphysics and the Trinity, the formulation of the Trinity has been placed squarely within a substance metaphysics, and this provides a grounds for viewing the Trinity as three persons in one being (Alston, 183ff, cited below). Tying this into the laws of identity, one finds that in order for the Trinity of persons to be one being, none of them can lack essential properties of the others. But, as noted, once one asserts that the Son (and/or the Spirit) are necessarily subordinate to the Father, one has separated their essential properties and therefore confounded the Triune nature of God. The Biblical arguments for such a position are fairly weak. For example, Ware and Grudem (and Kleinig, who does make this argument) argue that 1 Cor. 15:25ff entails the eternal subordination of the Son. But these verses explicitly state that “God may be in all in all.” It does not state “God the Father alone may be all in all” (I owe this point to McCall and Yandell, 342-344). It may be that these theologians are not drawing this necessary role subordination from Scripture so much as allowing their other theological dispositions to color their trinitarianism. Grudem, Ware, and Kleinig are all explicit complementarians–that is, they restrict women from the ministry. Now please understand I absolutely do not think that complementarianism entails this position on the Trinity. However, I am asserting that complementarianism can color one’s perception of the doctrine of God. Why think that the correlation between those who hold to necessary role subordination and complementarianism is interesting? First, because necessary role subordination, if true, would give some philosophical bolster to complementarianism; second, because at least one complementarian makes the connection himself. Regarding the first point, complementarianism has been struggling with a major philosophical challenge presented by Rebecca Groothuis (among others). Namely, the problem of how to ground the subordination of women. Groothuis argues, essentially, as follows: If the permanent, comprehensive, and ontologically grounded subordination of women is justified, then women are inferior persons; Women are not inferior persons; Therefore, women’s subordination is not justified (Groothuis, cited below, 317). Now I’ve defended this argument elsewhere, and I think that some complementarians actually agree with the general argument. Instead of rejecting complementarianism, however, they choose to model their doctrine of the Trinity in order to try to preserve their position. How? By grounding subordination analogously in the submission of God the Son to God the Father. Here, Kleinig is an explicit example of this position. Following the quote at the beginning of this post, he writes, “Those who serve in [the pastoral ministry] pass on what they have received from God the Father through Christ… The exercise of the public ministry depends on this pattern of subordination within the church…” (Kleinig, 223). Now, the subordination of Christ, it is claimed, “has nothing to do with the dominance and power of the Father. It involves and expresses the harmony of the Son with the Father and his love for the Father” (Ibid). Thus, according to Kleinig, the model for women and men in the church is grounded in the Trinity, and because, according to him, the Son is subordinate to the Father yet remains equal, so too should women be subordinate to men and yet remain equal. Does this complementarian view entail necessary role subordination? It seems so. For what is woman’s role subordinate upon? It seems it must be because of her being (for an argument to that end, see my post linked above and here). Yet her being is, of course, her essential nature. It is necessarily the case, therefore, that she is subordinate. Finally, it is interesting to note that even were the egalitarian to grant to Ware, Grudem, and Kleinig their points about the Son’s subordination to the Father, it would not follow that the Trinity is an adequate model for women in the church. Why not? Kleinig essentially says it himself, “Now this call to subordination in the divinely instituted order of the church is based on the willing subordination of the Son to the Father” (Kleinig 223, emphasis mine). Well that’s exactly the point egalitarians make! Egalitarians argue that the roles of subordination in the church are taken willingly by those who serve at various levels. The laity has not been called to the ministry, and therefore willingly cede the authority of the office of the ministry to their ministers. It is a bit stunning to see Kleinig make this remark, for it also undermines his own case. Women, unlike Christ, are not [all] willingly subordinate. Rather, some very much would like to be ordained. Thus, if Christ’s subordination is grounded in his “willing subordination” then it seems that Kleinig’s case has completely evaporated. So too, of course, has the case of other complementarians who make this argument. Do I think that those who make these arguments are heterodox? I wanted to explicate that I think that Ware, Kleinig, and Grudem are more likely victims of misuse of philosophical theology and their own presuppositions than they are actually trying to claim that the Trinity is not of one being. Certainly, I think, were they to examine their position on the subject, they would distance themselves from such a claim. Instead, as I’ve pressed, I think they’ve allowed their presuppositions–that women cannot be pastors and that they must ground this in the Trinity–to cause philosophical confusion on the topic. Kleinig, for example, almost so much as admits this point when he favorably cites Willliam Oddie, making the claim “that the ordination of women would involve a radical changing in the teaching of the church about the fatherhood of God” (224). It seems that it is not so much egalitarians who are guilty of misconstruing the Trinity, but rather over-eager complementarians who are shaping the Trinity to match their own preconceived notions of subordination and roles. Perhaps it should serve as a warning to take more care when doing philosophical theology and systematics. In any case, I sincerely hope these Christian brothers do not reject the doctrine of the Trinity as one being. The theological implications of this discussion can now be brought to light. Some complementarians, in their eagerness to support their philosophically vacuous position, have read eternal subordination into the doctrine of the Trinity. I agree that complementarians are correct to worry about the implications of women’s ordination for the doctrine of the Trinity, but I disagree with their conclusions. In their zeal to exclude women from the ministry, they have undermined the doctrine of God. By confusing the willing, economic, salvific role of Christ submitting to the Father in a contingent manner with the eternal, ontological “subordination” of women, complementarians have mounted an attack on the Godhead. 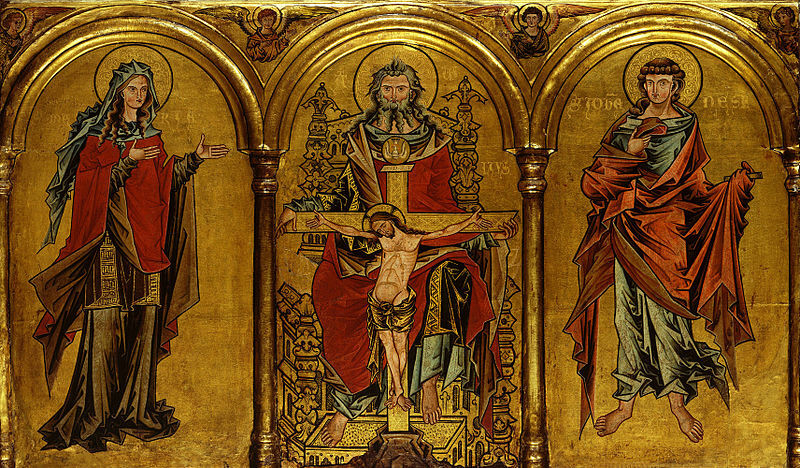 Indeed, as has been shown above, their position entails the that the Trinity is not “of one being.” Thus, it is a position that must be rejected. Again, I do not think that all or even most complementarians hold this position in relation to the Trinity, but those who do must consider the theological implications of their position: it entails that God the Son lacks at least one essential property of God the Father and therefore is of a different being; it fails to adequately account for the Scripture related to the Trinity; and finally, it doesn’t even make their case because the subordination is grounded in Christ’s willingness to do so. In light of these major problems, it seems complementarianism, when tied to necessary role subordination, must be rejected. Should it be rejected outright, even with such ties severed? I certainly think so. Complementarianism is philosophically tenuous and can’t account for all the Scriptural evidence (see Philip Payne’s book, reviewed here). It is time to stop allowing preconceptions to shape all doctrine. Rather than reforming God in the image of complementarianism, we should allow God to shape our image of humanity. God is coequal, with no essential properties split among His being. Similarly, human kind is equal, sharing the image of God. Man and woman: one in Christ. William Alston, “Substance and the Trinity” in The Trinity ed. Stephen Davis et al. (New York, NY: 1999), 179-201. Rebecca Groothuis, “‘Equal in Being, Unequal in Role’: Exploring the Logic of Woman’s Subordination” in Discovering Biblical Equalityed. Ronald Pierce and Rebecca Groothuis, 301-333 (Downers Grove, IL: InterVarsity Academic, 2005). John Kleinig, “The Ordination of Women and the Doctrine of the Holy Trinity” in Women Pastors? The Ordination of Women in Biblical Lutheran Perspective (St. Louis, MO: Concordia, 2008), p. 217-225. Thomas McCall and Keith Yandell, “On Trinitarian Subordinationism”Philosophia Christi 11-2, 2009, p. 339-358. To summarize JW Warick says: Jesus willingly submits to the Father. But this doesn’t apply to women because not all women are willingly subordinate. Therefore there’s no relationship between Jesus and women and women do not need to follow Jesus’ example. Aren’t we supposed to be like Christ? And if not, then that’s because of fallen nature. I see no disconnect with Kleinig’s argument. JW Warick says: Complimentarians believe in subordination which undermines Trinity being one, therefore they are wrong. That was my original question. Seems like egalitarians are not able to reconcile Trinity being one and being three at the same time. To me, JW Warick doesn’t seems to understand 1. women (also men) have fallen nature 2. Trinity can be both one and three at the same time. The subordination I was discussing was not submission to the Father but rather submission to males. It seems that this comment has missed that parallel which I was drawing. Regarding the Trinity: what argument have you made towards egalitarianism splitting the Trinity? How, for example, would the equality of two genders of humans somehow affect the ontology of the Trinity? It seems to me any theological argument like that which you hint at would be basing the Trinity upon anthropology, which is simply mistaken. You are saying that Jesus being subordinate to the Father entails that the Trinity is not one. But Trinity could be 3 or 1. There’s nothing to be rejected here. The Godhead is of one substance, one being. That has been universally acknowledged by the Church in the historic Nicene Creed. Thus, if a position entails that this being is divided, it is false. If the Son is not subordinate, why would the Father present him to us that way? The Son is subordinate in the incarnation. The Son is not eternally subordinate. You continue to raise new issues rather than address the ones which were already discussed. Please see the section entitled “The Case for Eternal Subordination”. Again, this does not actually address the issues I have raised herein. If one argues that the Son is eternally subordinate, then by necessity the Trinity is divided in being, which is universally denied in the Creed. I doubt many Christians even know what the Nicene creed is. Just think of marriage as 2 people but 1 body. They are one but I can interact with the husband and the wife separately. Aren’t they 1 body? Don’t they take up 2 seats on a plane? Do you accept this seeming contradiction? I think your understanding of the Trinity is confused on a number of levels. The Godhead is one being but three persons. The way you are trying to describe the Trinity shows that you are doing exactly what I have argued: you are using anthropology to guide your doctrine of God. You look at human relationships and then you project those onto the deity. This is terribly confused. Moreover, the analogies you use are very odd. In what sense, for example, do you mean that married people are “one body”? Obviously this does not mean that their bodies merge and become one, nor does it mean that they share the same essence. Yet God, the Triune God, is one being. Period. There are not three individual beings, but rather one being. There are three persons, but these three persons share one essence. Regarding the Nicene Creed- your willingness to throw aside what the church universal has taken as true for over a thousand years is very troubling. Frankly, I think that this could help explain your own misunderstandings of the Trinity. Rather than placing yourself within Christian orthodoxy, you seem to prefer to come up with strange anthropomorphic descriptions of the Godhead. To be blunt, I reject that entirely. The way you have described the Trinity so far is borderline tritheism. And, just as an aside, a simple search of “nicene creed” on google turns up doctrinal statement after doctrinal statement, across denominational lines including official Lutheran, Episcopal, Roman Catholic, Methodist, Reformed, and Baptist church web sites. It looks to me like plenty of Christians know what this Creed is. Sigh.. now we resort to attacks and long windedness. I will just try to keep things concise and not throw in attacks. Let’s forget about how you said the creed was “universally” accepted even though not many at most mainstream churches knows what it is. 1. You still haven’t answered my temporal question. 2. “There are three persons, but these three persons share one essence.” 3 persons can still be subordinated disregarding if they are or not. I’m trying to focus on one issue at a time here. Show me where there are personal attacks. I have argued and shown how your theology is based upon anthropology. You are grounding doctrine of the Trinity in an analogy about marriage. That simply is using a human oriented notion to describe the Godhead. Regarding your second point, I clearly affirm that. I agree that people can be subordinated. The problem is eternal subordination, and I have argued how this distinction is important in this very post. You have failed to address my point in any way. Regarding Genesis 2:24- I do not see how this passage entails that the two people become physically and essentially one person. In fact, if you look at Luke 20:27ff, we see that this becoming “one flesh” is obviously not an ontological union of essences. Thus, the analogy fails. So again, I am forced to wonder where you are drawing your doctrine of the Trinity from. Regarding the Nicene Creed. You are being disingenuous or perhaps misunderstanding in how I meant “universal.” In fact, you conflated “universal” with “universally accepted.” Clearly these are different things. What I mean by the church universal has defined the Trinity by the terms in the Nicene Creed is exactly that; that the orthodox Christian church has across these hundreds of years accepted across all branches that the Nicene Creed is a proper definition of orthodoxy regarding the Creed. Obviously, one could find any number of people who don’t know what it is. That doesn’t do anything to undermine my point. So again, let’s refocus on the central point here. I have, in this post, argued that eternal subordination splits the Godhead’s essence. You have yet to offer a counter argument. Please present one so that we can move forward in this discussion. It is interesting how only egalitarians use the Nicene creed to back up their arguments. From what I read it is essentially as you said that the Trinity is one. How convenient to be able to only need to focus on the oneness aspect of the Trinity instead of the ‘threeness’ as well. I guess there’s no answer to the temporal question. Again, I am focusing upon the oneness aspect because that is exactly what is rendered impossible by eternal subordination. Of course you need both. But if that is the case–if the Trinity is three persons in one being–then if a notion entails that this is not the case, it must be false. I have argued extensively that eternal subordination entails a split in the oneness of being. So far I see no answer to that argument. Nevermind, I found the answer. Athanasius argues that the reason the Son was temporarily subordinated is because the human traits could not be read back into the eternal Trinity. That seems acceptable. The next question would be, could it be that women’s subordination is also temporally required? And that equality is to be appropriated in eternity. The Bible speaks too much about the subordination character of the Son for me to write it off as just temporal. This does not seem like a principle to follow. I’m not sure how the number of references to a doctrine mean it is eternal. Are there any references that speak of the Son being specifically eternally equal? Are you saying the Son is not equal to the Father? Anyway, John 5:18, John 10:30, Colossians 2:9, John 5:19-21, Isaiah 9:6 (prophecy of Christ = God), John 14:9, John 20:28, 2 Cor 4:4, Hebrews 1:8… and we could do any number of passage comparisons of OT with NT to point out the ways Jesus claimed equality with YHWH. I admit I’m disturbed by the wording of your question here, though. The implication seems to be that you do not hold that God the Son is equal to the Father. Is that correct? I just wanted to see your side of the evidence. You didn’t answer the question. Do you believe the Son is equal to the Father? I can’t fathom the mysteries of God (Job 11:7) but I know you can’t reject either. That’s not an answer to the question. One last time: do you believe the Son is equal to the Father? If I knew all the answers, I would be God. Agreed. But of course I’m not asking you to know all the answers. I’m asking you to answer one single question, which you refuse to do. After thinking about it longer I feel that the Complimentarian claim that the Son is equal and voluntarily subordinated to the Father shows that women can be both equal and also voluntarily subordinated, is a little far fetched. I think that the argument and counter argument is going down the wrong track and effort should not be spent this way. That being said, I believe the Son and Father are equal and the Son voluntarily and temporarily subordinated in order to fulfill a purpose. Nevermind, I found the answer. Athanasius argues that the reason the Son was temporarily subordinated is because the human traits could not be read back into the eternal Trinity. I enjoy reading your posts and appreciate your efforts in researching and articulating these matters. My question is, how do you respond to someone who says that the subordination of the Son to the Father is not eternal, but for redemption, and in the same way, wives are subordinate to their husbands temporarily, while they are on earth, as there is no marriage in heaven. (Of course, their understanding is based on the “submission – head” verses of Ephesians 5).